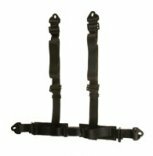 A 4-point tactical light vehicle safety harnesses is available as an option. Complies with - ADR4/04 or AS/NZS 2596. The Electric buckle replaces the normal buckle on a seat to add cut-out switch functionality. The wiring is integrated in the vehicles electrical system to prevent operation of the vehicle if the seat belt isn't buckled in. The 250mm long stem seat belt buckle from Stratos is helpful when a seat belt needs to be moved out of the way to allow a seat to swivel. The Seat belt extension buckles into the original seatbelt to extend the length by 200mm. For a seat demo, please visit a Stratos Dealer near you.